I am about to be off on a BIG journey and won't be home until the end of the month. Here's a page in my calendar journal that I colored and doodled. Then I stamped some Asian images and added this postage stamp I had in my stash. I made this spread a few weeks ago but have saved it for this post. Thought it would be the perfect art piece to leave everyone with. I won't be posting, but promise to come back with lots of photos to share. Hope everyone has a fantastic next 10 days and spring weather arrives in everyone's world. I will see you all when I get back. I'm thrilled you shared one last entry with us, because I had planned to stop by and wish you a great trip. I know you will have fun, and believe me, I am going to miss you. I look for your art every day and I'm going to miss your comments, too. Please enjoy yourself and have a wonderful trip. I am almost as excited for you as you are. OK, maybe not, but nearly! Have fun, stay safe, and enjoy your time away from teaching. Just think. Last year at this time, you were making plans to lose a kidney. enjoy, take pleasure, amuse yourself, have a good time, anticipate! wow,beautiful fishies pages my friend,love the blue water with all this wonderful koy fishies. have a wonderful sunny day,here come the summer,beautiful weather is here. This page must have taken you forever but it is such fun and I love it -- the colors, the movement, the energy. Have a wonderful time in Japan! Can't wait for the recap. Your page is the perfect gateway to start your Japanese adventure. Have a safe and wonderful time. Take lots of pictures. This is a beautiful last page before your travelling to Asia! I wish you the best for the next 10 days, fantastic weather and time! I am curious about your photos you will bring back! I am late calling in, I hope you have had a safe journey. Enjoy your trip to Japan, take lots of photos to share with us all. Your journal spread is fantastic, happy colours and lovely Asian additions. Safe travels and wonderful adventures to you, Erika. This is very pretty. 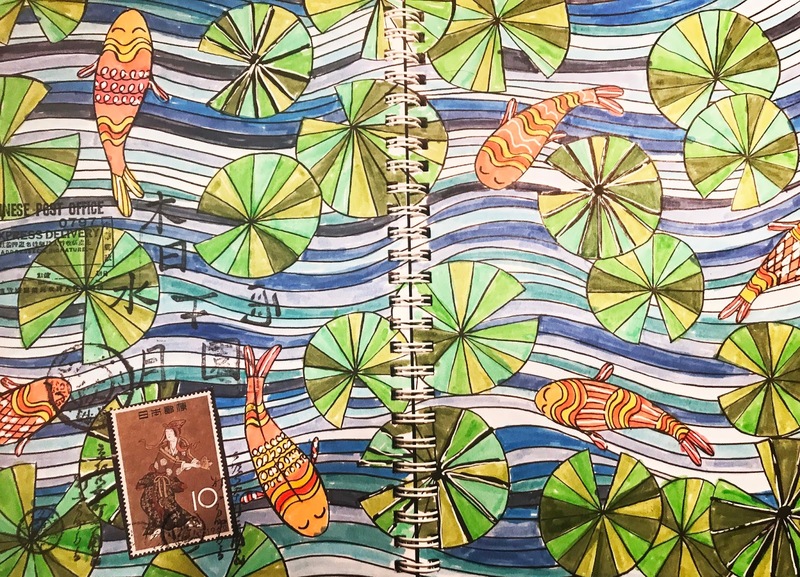 I like the fish swimming happily among these green circles. I see they all have a bite taken out of them so assume they are tasty to the fish. Looking forward to reading about your Japan trip and seeing photos. Enjoy and then enjoy even more, Erika, and safe travels and return home. Wonderful spread in anticipation of your exciting trip, Erika. A Japanese store just opened in Guadalajara. I had fun shopping and was delighted when I checked out. The clerk greeted me with "konichiwa." Then when I was leaving, "domo arigato."